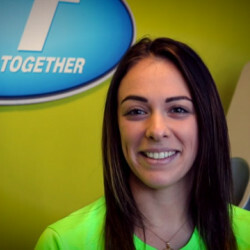 Get to know our friendly Fitness Together® Personal Training Staff at Concord OH. Dawna grew up not too far away in Canton, Ohio. She received her BS in Chemistry from Walsh University where she also excelled on the soccer pitch. A very active member of the Greek Community, she has been a Greek dancer her entire life, and has even coached basketball for their church's youth group! She enjoys playing sports and learning as many new activities as possible. She loves to be active outside of the gym; and always tries to find new fun things to do for exercise besides just lifting weights. Dawna is certified as a personal trainer thru ACE, and our clients love working with her - you can schedule an appointment with Dawna Monday through Saturday mornings...we have no doubt that you will appreciate her positive, energetic personality as she shares her passion for fitness with you!